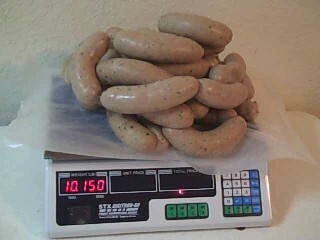 Boudain is also spelled "boudin". The first part of the video series begins at the bottom of the play list: Part 1 of How to Make Boudain. I hope you learn something. Enjoy! Note: For a meatier boudain sausage reduce the cooked rice content. Boil the first 6 ingredients until tender then grind. Reserve some of the broth. Add rice, salt, pepper, green onions, and parsley. Add enough broth to make a moist dressing. Stuff dressing into the casing using a sausage stuffer. You can find a world of useful information at Ask the Meatman. Check them out to learn about natural casings for stuffing sausages and boudain. They are a reputable company who has been around since 1949. Boudin can be served as a breakfast sausage or as an appetizer. It can be boiled, fried, steamed or heated in the microwave oven. Often times the ingredients needed to make the old fashioned type of boudain is not readily available at your local market. You can find an alternative recipe under Boudain (boudin) Balls which you can use. In Cajun country it seemed that thirteen represented that magical age during which the attainment of certain rites of passage on the way to man-hood was inexplicably thrust upon me like a beast of burden. It was time for me to venture away from the bird nest, so to speak, amble over to the end of the limb, spread my wings and flap them a few times while standing in place just to get the hang of it for when it came time to take flight (or, in my case, when grandpa decided that it was time).